Currently living/working in: We are back on the road for Leave No Trace as one of their Traveling Trainer teams until April 8. Our schedule has us starting in Colorado, and actually coming back through here a lot. But we’ll also be bouncing around Utah, Wyoming, Arizona and potentially New Mexico. Very stoked to be back on the road doing environmental education & outreach!! 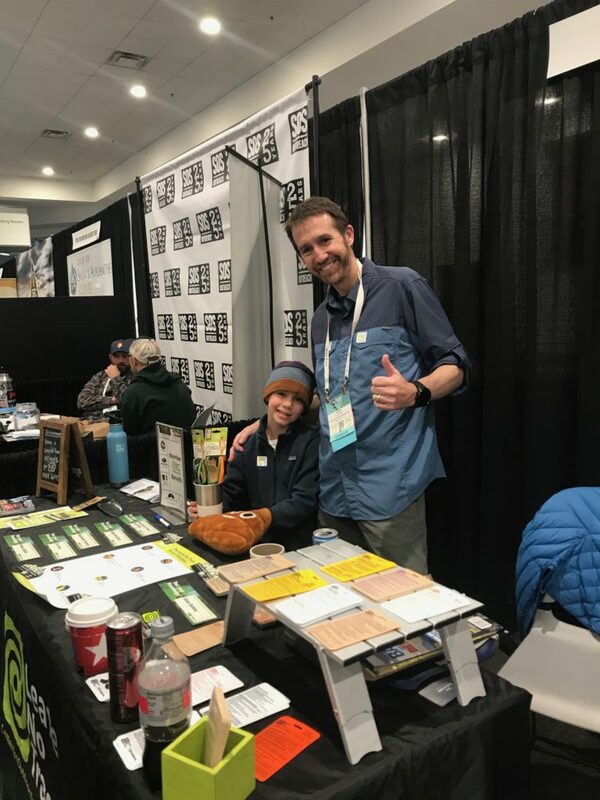 Since we were working in Denver, CO, we had a little help at our first event from one of our nephews! Current mood: Adulting is still hard and my dad is still in subacute rehab care, declining. But I guess it’s becoming the norm and I am rolling with the punches. If anything, it has brought my sister, mom & I even closer together!! Currently excited about: Spending so much time in winter conditions!! I say this lightly. Our job will have us outside A LOT this winter in some of the most scenic wintry places. But I am sure I will be complaining of frozen toes and chapped lips after a week of working outside. 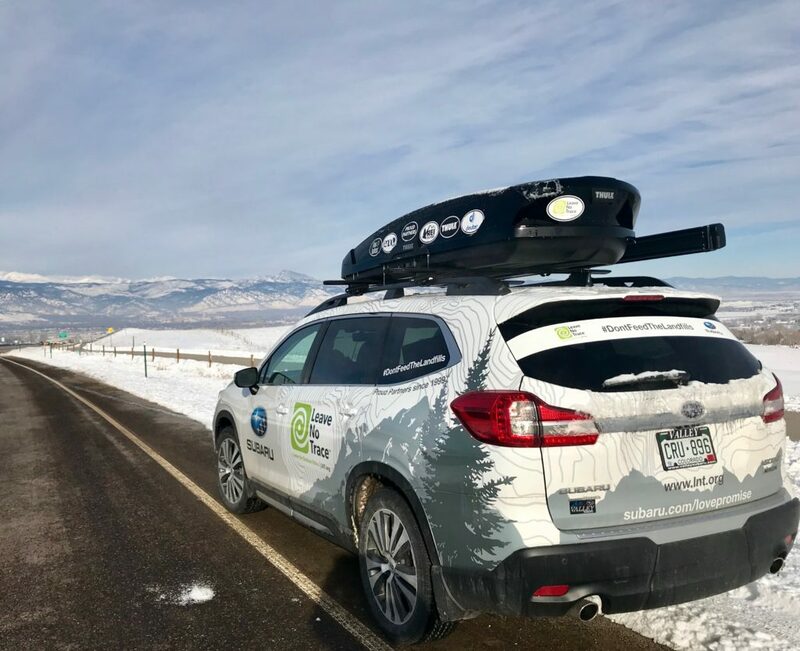 Current guilty pleasure: As part of our Leave No Trace Traveling Trainer role, we received the brand-new 2019 Subaru Ascent. It has all the bells and whistles. Heated seats, heated steering wheel, front & back cameras, XM radio … we are definitely spoiled. Currently proud of: Our new online Backpacker column “Gear of the Week” has launched! It is quite a bit of work picking items to be tested, getting them out for testing, collecting the feedback from testers, writing a review and not crying over the returned draft with edits. But, seeing it posted is sweet reward!!!! Here’s one from Justin and one from me. Also, Justin has a short article about his first pair of hiking pants in the March issue of Backpacker on page 42!!! Currently not excited about: I got 2 more rejections from publishers for my book this month. Do y’all even remember that I wrote a travel memoir??? That manuscript is now TWO YEARS OLD. And there are still publishers getting back to me from my submissions within the past 2 years. And by getting back to me, I mean rejecting me. I’ve received 17/35 rejections. Should I still be hopeful for the other 18???? Currently regretting: We are selling our 2016 Chevy Trax on Saturday, and we are still unsure if it’s the best choice. It’s just that the car sat around all summer, and now will sit around again until summer. And even though we aren’t 100% sure what we are doing past May, the way it’s looking, it will sit through the fall. I don’t think there is anyone else who churns cars like us! Current confession: Most people know we live in 2-4 month increments. For 2019, we pretty much know what we are doing through May. But beyond that? There are several possibilities (as usual). I always have some anxiety (self-induced again, go figure) over the uncertainty, but I also trust things tend to work out for the best. Stay tuned!!! Currently thankful for: My sister-in-law gifted me a “weighted” blanket out of the blue to potentially help with my insomnia. Has anyone ever used one? It takes a little getting used to (it is TWELVE pounds), but I really think I like it and notice a difference. At the very least, it seems when I wake bright eyed at 3am, it only seems to take me 1 hour to fall back to sleep, versus 3 hours. Currently amazed by: When we were down in Mexico this month, my spanish speaking came back to me! Most people don’t know I double majored in English and Spanish. I haven’t used my Spanish since 2001, but I was pleased with the bits & pieces I could understand and speak. Maybe someday I’ll be fluent again. Currently reading: I finished “The Great Alone,” by Kristin Hannah. I loved it, but every time you turn the page, there was some new tragedy with this family (fiction). Currently watching on Netflix: We’ve been very sporadic lately, just because we’ve been busy and not always together! So basically nothing to report. Oh. I have wanted to try a weighted blanket. Do two heavy cats sleeping on me count? I feel your pain in the book realm. Email me and let’s discuss. I might have some ideas. Also, my agent has had my ms for two years. I’m afraid to ask what’s going on with it. Sigh. Ugh. Books. I don’t want to think about that. Maybe we need to plan a fall hiking event with you two? ?